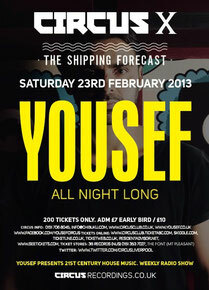 Circus returns to The Shipping Forecast on Saturday February 23, and this time the session is helmed by Yousef. The club’s founder, promoter and resident takes over The Hold for a full four hour set behind the decks, giving him the chance to really indulge everyone as he crosses techno and house. Yousef’s work ethic shows no signs of slowing either. Taken from his second artist album, ‘A Product Of Your Environment’, on Circus Recordings, ‘Beg’ (which is now signed to Defected) reached the top spot of Beatport’s deep house chart for eight weeks and was as high as number three on the overall top 100 for seven weeks. Defected have just taken two more album tracks too, the next release the self-penned vocal track ‘Think Twice’, which comes with remixes by Catz & Dogz and Fred Everything. Circus Recordings have also recently signed tracks from Guti, Green Velvet, DJ Sneak and Liverpool’s David Glass, who's current ‘Lost’ EP is working for the likes of Loco Dice, Carl Cox, Richey Hawtin and Nic Fanciulli. Circus events are now in London, Birmingham and New York, and its home in Liverpool looks set to be an even bigger year than 2012, with its first major show dropping in on the Easter Sunday Bank Holiday.